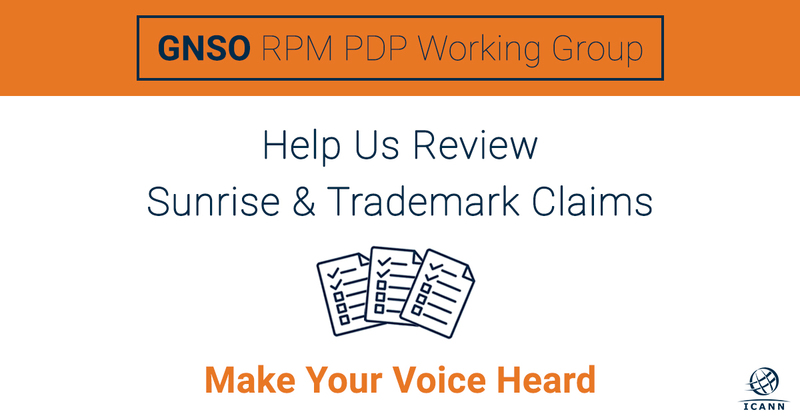 LOS ANGELES - 06 September 2018 - The Sunrise and Trademark Claims survey is now available for individuals interested in sharing their feedback about these Rights Protection Mechanisms (RPMs). The Sunrise and Trademark Claims RPMs were adopted as part of ICANN's New Generic Top-Level Domain (gTLD) program. This feedback will be essential to the evaluation of these Rights Protection Mechanisms and ICANN's data collection efforts related to them. We invite you to take the survey if you or your company registered a domain name in new gTLDs, attempted to register a domain name in new gTLDs, or considered registering a domain name in new gTLDs. The survey launches today and will run until Friday, 28 September 2018.